I took a big risk a few months ago by putting on my cheesy teacher hat and pushing out an idea that came to me as I was trying to encourage my students to use IXL. Oh, the look on their faces! I then proceeded to pass out white paper copies of this iPhone template I tweaked from Coffee, Cats, and Crayons on TPT. The iPhone incentive is working well in my room. Students earn one sticker for each LA skill they complete to satisfaction. As I wrote before, I’m flexible with the SmartScore to accommodate all learners. I check their progress once a week by customizing the the reports and award apps/stickers in a little one-on-one conference. A student selects his apps for his latest progress on his IXL ticket and gets to upgrade. Once their iPhone 1 is filled with 12 apps, they upgrade to an iPhone 2 and so on. Their old phone goes in the “showcase” under the dry erase board. Only a snapshot of the dozens of iPhone 1s and 2s that have been retired in the showcase. Students receive a prize for upgrading, as well. This was a fun day ~ The day I shared all the prizes connected to the upgrades. They got a kick out of this. Recently I had one student upgrade to the “Mint Green iPhone Cuatro.” He is the the envy of many; not because he got a prize from Prize Box 1 but because he was the first. Scoring a 100% in Newsela Quiz earns you 2 apps, while a 75% earns you 1 app. I had a tiered level of rewards for growth in winter MAP scores. Perfect attendance by the whole class for the week or 100% completion of homework. Sometimes just helping out in class or being a leader earns you an app. Playing the part of a Verizon salesperson is challenging, but I’ve spent enough time in Verizon to know key phrases that make it feel authentic, which makes it even funnier. Almost all of my kids love it. Oftentimes, making a reward silly is all it takes to reel in a middle schooler. Sometimes, it’s about making the experience seem like a reality. Not many of my kids have iPhones, so this is almost like having the real thing – even if it’s just within the walls of my classroom. Always, it’s about ensuring everyone sees some success and everyone gets credit for working hard. What do you think of my incentive plan? Could it work in your classroom? Do you do equally silly or crazy ideas to motivate students? I’d love to hear your ideas, questions, and thoughts in the comments! 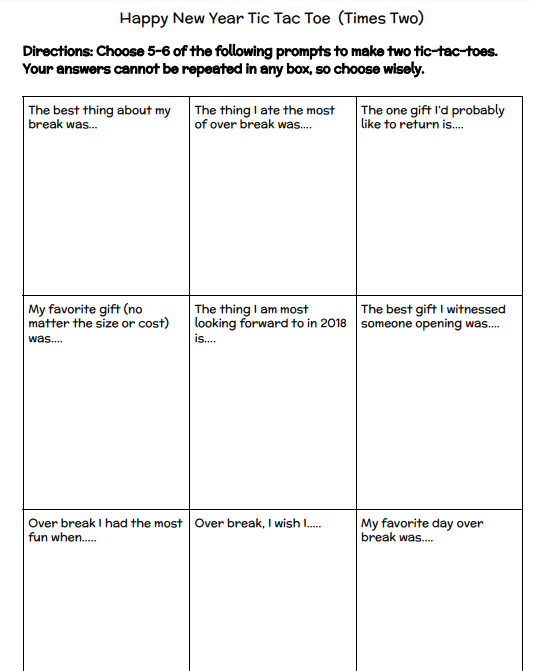 I want to hear about everyone’s break, but I also don’t want to stress any of my students out with a standard journal prompt about their best gift or favorite part of being away from school. Shortly before break, I saw a quote on Instagram (which I will paraphrase here): The best part of the holidays for some kids are the days leading up to break. Not everyone had the best break. Not everyone got trendy clothes, cool shoes, expensive gadgets, or a wallet full of gift cards. Not everyone had family surrounding them. Not everyone had delicious meals around a big table. I’m asking my students to respond to just 5 or 6 of these prompts, because then I will know how their 2017 ended and how our 2018 will begin. I hope your holiday break was filled with rest, relaxation, and some fun. I hope you are recharged and ready when that alarm goes off in a few days. May 2018 be your happiest Happy New Year yet! Which Outsiders Character are You?